I was excited to begin reading this book. It had a mixture of historical romance tropes that I like- spies, governess, marriage of convenience etc. I love historical romance with suspense so I was anticipating good things. I liked the opening chapters of the novel. It had a very promising start with the dramatic and tragic death of James' sister who was tortured during the previous mission. This gave me tingles because the author wasn't afraid to kill her characters, even the good heroic ones. It's not only the villains that bleed in this book. Vivian, the governess, has also lost her brother and agrees to spy on James Spencer in return for information about her brother's killer. I liked the way the pair bonded and developed a friendship. However, I didn't like the lack of action and suspense. There was no immediate mission except to get James married and teach Vivian how to handle herself in a fight. The middle of the book right up to the closing chapters were very slow and I was disappointed in the direction the novel took. Much is made about the family being spies for a secret organisation called Clocktower. However, there is no story or plot revolved around it. 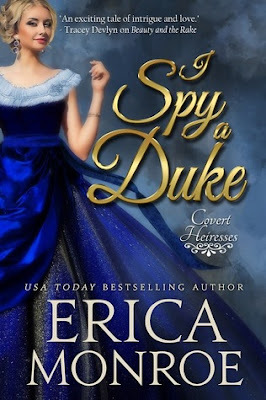 James, Vivian and his sister, Arden move from the family's country estate to another country house to train Vivian in the ways of a spy, ie, basic self defense. This is all that happens and I was really disappointed as I was expecting a little bit of suspense and proper spy work. I would have loved to see Vivian and James actually go and investigate something together rather than hang about the house and gardens all day. I didn't quite believe the threat facing Vivian. Why send her to get information that James is a spy when the villain already knew that he was one? Why bother killing her? I loved the two main characters James and Vivian. Both were strong, likeable characters. I was glad that the author didn't drag out Vivian's duplicity in spying on James. Once she realises her error she tells him everything. He, being the gentleman that he is, promises to help her. I also liked James sisters and the little group of friends he has within Clocktower. I will no doubtedly check out the rest of series when it's available as I'm a historical/regency romance addict. Also, James's sisters appear very eccentric and feisty which should, hopefully, translate to a fun read. But, I really hope that the characters actually involve themselves in a mission instead of just talking about it.